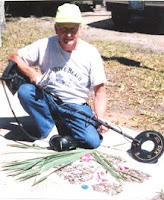 Over the years, Harold had found many scintillating treasures with his metal detector: pennies and bottle caps, fishing lures and amorphous lumps of rusted metal, to name just a few. But the old beachcomber dreamed of finding more beneath the golden sand. Much, much more. As he was making his rounds on the beach one day, a strangely enchanting melody suddenly issued forth from his metal detector. Harold immediately fell to his knees and began digging through the sand until his trowel clanged against a metal hatch, a sound that sent shivers of recognition through his bones. With trembling, arthritic hands, he lifted the lid of the hatch to reveal a narrow staircase ― a staircase he had seen in his dreams a thousand times! Now his heart began to pound. Wasting no time, Harold lay his metal detector on the ground and followed the stairs down into the darkness. He soon found himself in an enormous cavern illuminated by baroque chandeliers that sparkled with innumerable tiny candles. Garlands of sweet-smelling flowers hung from the walls, their delicate pink and yellow petals littering the floor like confetti. And there were elves, throngs of large-breasted she-elves, clad in shimmering, chain-mail miniskirts and low-cut velveteen blouses, strumming lutes and drinking nectar from silver chalices. Exactly as Harold had so often fantasized! Come, come, the elves cried lustily, we’ve been waiting just for you! Several of them took Harold by the hand and led him to an enormous black stone, from which a golden, jewel-encrusted metal detector protruded. Whosoever pulls the metal detector from the stone shall be our rightful king evermore! they squealed in delight. Harold took a long look around. Then, to the dismay of all the elves, he politely declined their challenge, explaining that in the underground elf-kingdom he had dreamt of every day since adolescence, there were also wizards and knights and a pair of wise-cracking unicorns, and nothing less would do. No amount of tender caresses and elfin tears were able to change his mind. Harold bade farewell to the crestfallen elves and made his way back up the stairs to the beach ― still confident that someday, somehow, his dreams would come true. I was once opening a beer bottle with my teeth and I snapped the top of one of my molars off. It was in Biloxi. I know that's pretty far from Maryland. But if Harold happens to come across a bit of silver with my tooth attached, have him give me a jingle, willya? Thanx!